Vienna's tradition with Christmas markets dates back more than 700 years, when the Duke of Austria granted permission for the city to hold its first December market in 1298. 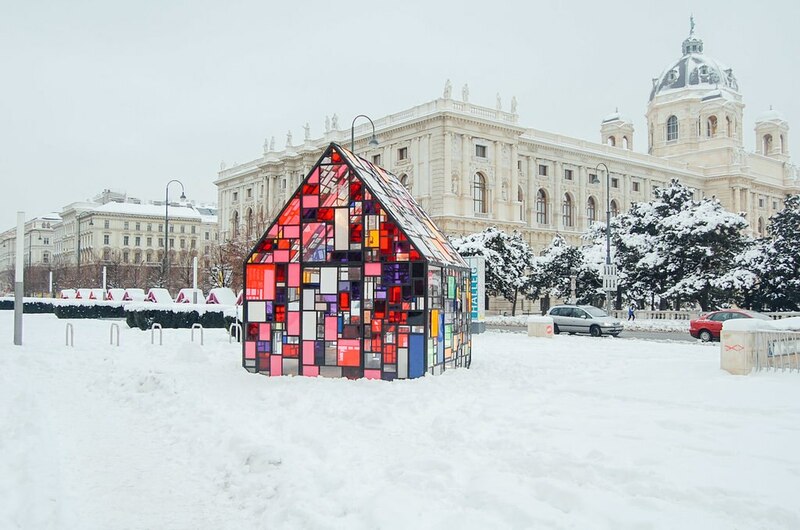 Today, more than 20 holiday markets take place throughout the Austrian capital, all nearby your Vienna hotel. As the stylized market huts appear during November and December, the smell of roasted chestnuts and glühwein (mulled wine) start to fill the air. Viennese markets offer a mix of handicraft shops, holiday music, and local foods in some of the city's most beautiful squares. The most traditional market in the city remains the Old Viennese Christmas Market on Freyung. Known as the Altwiener Christkindlmarkt, the market is nestled in between palaces and churches in the heart of the city. The yuletide fair specializes in handicrafts, particularly candles and holiday decorations, though sausages and local produce are also widely available. After exploring the shopping stalls, peek behind the huts to discover the nearly 50m long nativity scene that adds an even more festive air among the twinkling lights of the old-style marketplace. Every Christmas season, wooden chalet-style shops also appear at Vienna's Am Hof Christmas market. "Am Hof" means "at court" because the market is located in front of a historic royal residence. Split between two parts, the holiday stalls sell high-quality Austrian arts and crafts, as well as traditional advent foods. Strings of local sausages, fried treats like kiachl pastries, gingerbread and Christmas cakes can all be found here - just a short walk from St. Stephen's Cathedral. But no Viennese market has a more beautiful setting than the Christmas Market in front of Schönbrunn Palace. Often blanketed in a dusting of snow, the romantic backdrop is the ideal holiday stop. The market offers rustic handmade goods, as well as mulled wine to warm chilly fingers. Daily free concerts from brass bands, choirs, and gospel groups keep holiday spirits high. After Boxing Day, the fair transforms into a New Year's Market, complete with even more holiday performances. 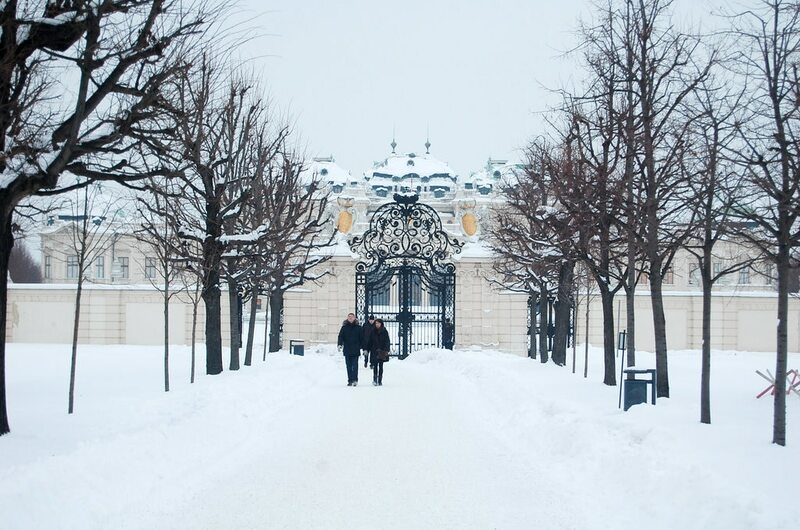 For another winter wonderland locale, visit the Christmas market at the Upper Belvedere Palace. Set on a lake, the palace with its decorations is reflected across the shimmering water. Market stalls offer holiday goodies ranging from blown glass ornaments to leather crafts, while food stands keep the hungry crowds well fed on fried potatoes and steaming Austrian dumplings. For children, an old-fashioned carousel adds even more magic to the advent event. But no December trip to Austria would really be complete without a visit to the largest Christmas market in Vienna on the Rathausplatz in front of city hall. Called the Wiener Christkindlmarkt, the advent extravaganza attracts millions of visitors each December. In addition to the artisan handicrafts, yuletide foods and impressive light displays, the market has plenty of activities for children. The parks on either side of the square have decorations, decked out Christmas trees and an ice rink for visitors, which all combine to keep holiday spirits high. 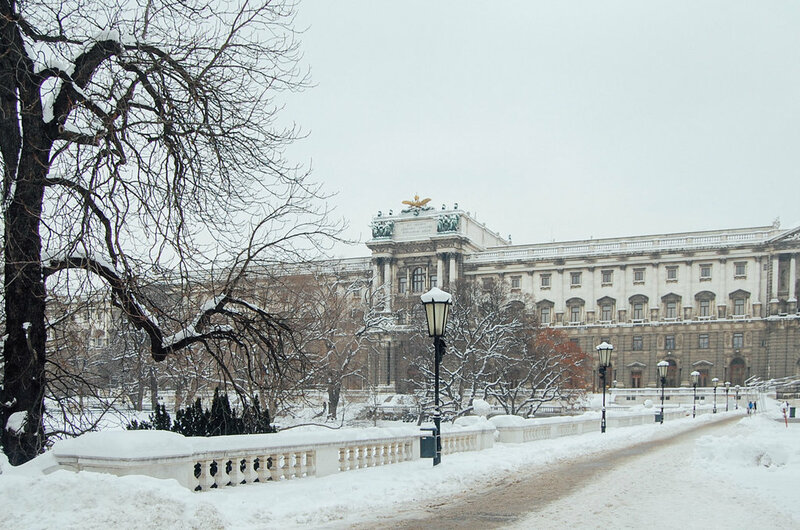 For more on Vienna, make sure to check out our holidays to Vienna and our 72-hour guide to Vienna! Hotel Nestroy sits on a quiet street, a 15-minute walk from the Prater amusement park with its giant Ferris wheel. Tarborstraße U-Bahn station is 2 blocks away, and it's a 15-minute walk to St. Stephen's Cathedral and the sights of the historic Old Town. Book a stay in any rate category and receive complimentary wireless Internet access in the lobby, voucher for 20% off food and beverages, and 1 complimentary drink at the hotel bar. Details at check-in. Restrictions may apply. Located in Schonbrunn, this hotel is within 3 mi (5 km) of Schoenbrunn Palace, Vienna State Opera, and Schoenbrunn Zoo. Secession Building and Leopold Museum are also within 3 mi (5 km). Hilton Vienna is a 10-minute walk from St. Stephen's Cathedral and Vienna's historic center. Guests can stroll across the leafy Stadtpark to learn about the city's rich musical heritage at the Haus der Musik museum. Vienna International Airport is a 25-minute drive from the hotel. Hilton Vienna Danube Waterfront is directly on the river, a 15-minute walk from the Prater park and the Messe Wien trade fair. Danube pleasure cruises dock close by, and the trip into the city center takes around 15 minutes from the nearest U-Bahn station, a 5-minute walk. Located in a peaceful part of the city, Hotel Imlauer Vienna makes a great base, with the Taborstr. and Nestroyplatz U-Bahn stations 5 minutes away. Guests can walk to the Prater amusement park, 10 minutes away, and ride the Riesenrad Ferris wheel which made an appearance in the movie The Third Man. Built in 1872, this 4-star hotel sits in the center of Vienna on Ringstraße Boulevard. It is 50 meters away from the Schottentor Underground Station (line U2) and 500 meters from the Sigmund Freud Museum. This family-friendly Vienna hotel is located in the historical district, within a 10-minute walk of Sigmund Freud Museum and Burgtheater. Vienna City Hall and Austrian Parliament Building are also within 15 minutes. Located in Favoriten, this hotel is within 1 mi (2 km) of Swiss Garden and Belvedere. Vienna State Opera and Secession Building are also within 2 mi (3 km). Located in Innere Stadt, this hotel is within a 10-minute walk of St. Mary on the Strand, Burgtheater, and Spanish Riding School. St. Stephen's Cathedral and Hofburg Imperial Palace are also within 15 minutes. Hotel Am Stephansplatz is across from soaring St. Stephen's Cathedral and next to Stephansplatz Metro Station. In less than 10 minutes on foot, guests can reach the Vienna State Opera and the shops of Kärntner Strasse, while the Museumsquartier with the Kunsthistorisches Museum is a 15-minute walk. Vienna Marriott is directly across from Stadtpark, with its flower clock and gold-plated Johann Strauss monument. 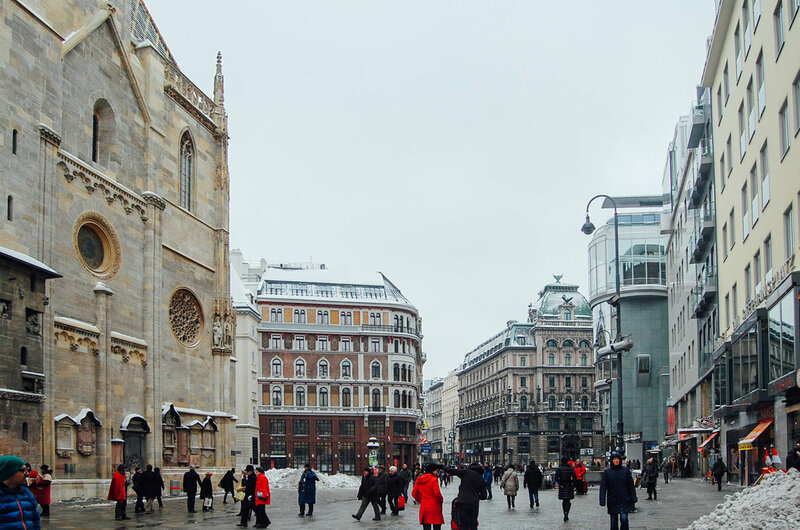 In a 10-minute walk, guests can reach St. Stephen's Cathedral and Vienna State Opera, as well as the shops of Kärntner Strasse and upscale boutiques at Graben. Located in Leopoldstadt, this hotel is within a 15-minute walk of Urania and Riesenrad. Wiener Prater and Viennese City Park are also within 1 mi (2 km). Le Méridien Wien is located in Vienna's historic center, just a 3-minute walk from the Vienna State Opera and 7 minutes from the Museumsquartier. The grand Hofburg Palace is a 10-minute stroll, and it's just a little farther to St. Stephen's Cathedral.